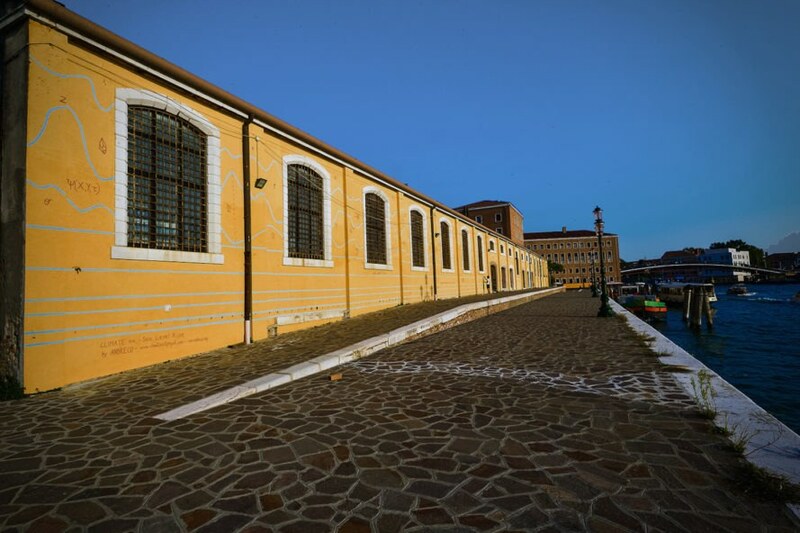 Artist Andreco has unveiled his latest art installation, Climate 04-Sea Level Rise in Venice, to raise awareness of the climate change conference COP 23 currently underway in Bonn, Germany. 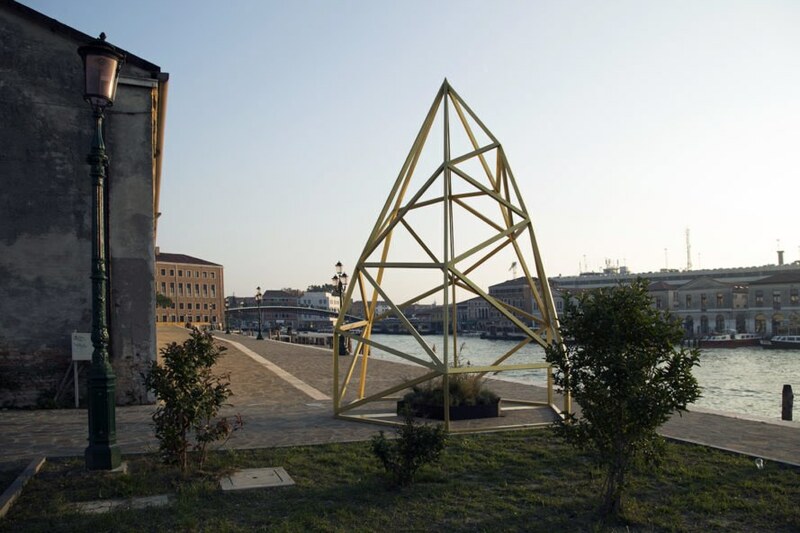 Introduced as a project promoting dialogue between the arts and sciences, the climate change-inspired installation calls attention to the effects of potential sea level rise in Venice. The site-specific project consists of three parts: a wall mural, a sculpture, and an academic conference. Climate 04-Sea Level Rise is the fourth iteration of Andreco’s ongoing Climate project, started in Paris in November 2015 during COP 21. 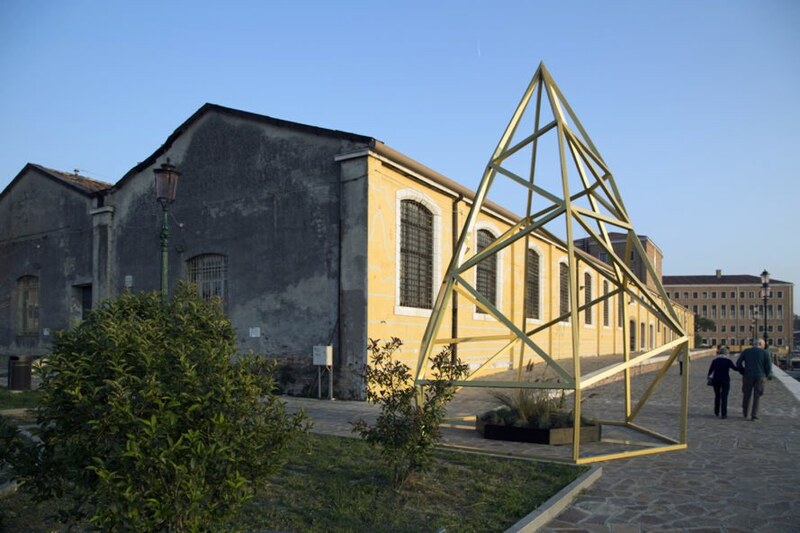 For each conference since, the artist has realized various site-specific installations that take inspiration from recent scientific research and estimates in climate studies. 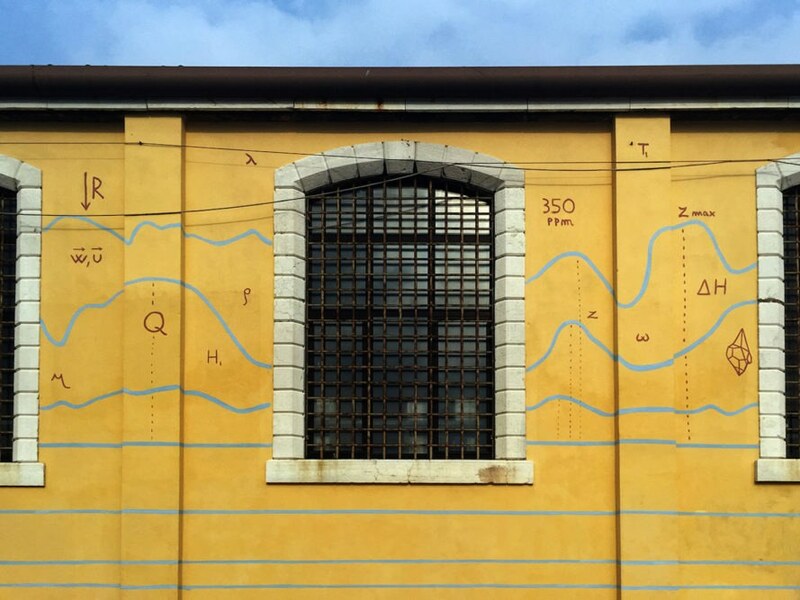 Andreco’s interventions in Venice begins with a giant mural, located next to Canal Grande in Fondamenta Santa Lucia, that represents his artistic interpretation about estimates and data regarding sea level rise in the Italian city. 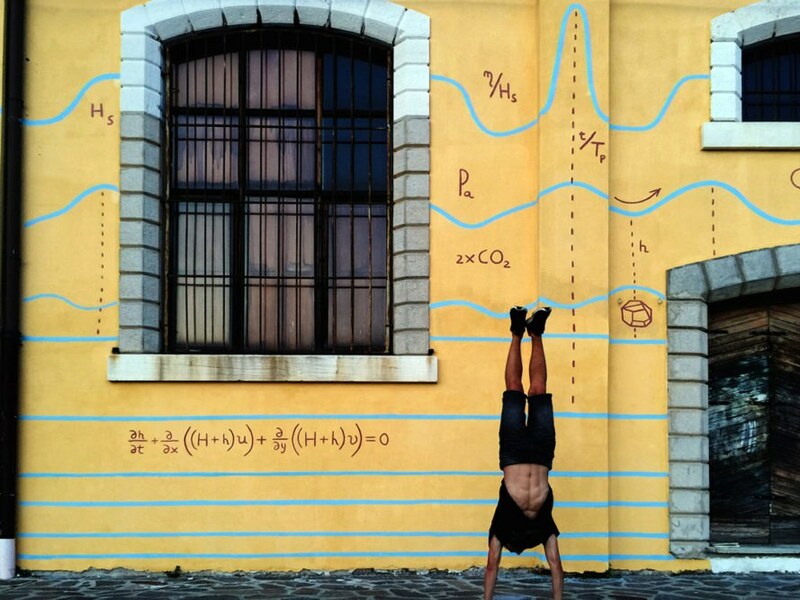 The mural is made of long curvaceous blue lines, punctuated by equations and mathematical symbols, mimicking waves that rise high above a person’s height. A crystalline steel sculpture to the side contains native coastal plants that speak to the importance of the landscape in combating storm surges. The last part of the intervention was a series of talks by international researchers held to stimulate public discussion about climate change. Climate 04-Sea Level Rise is the fourth iteration of Andreco’s ongoing Climate project, started in Paris in November 2015 during COP 21. 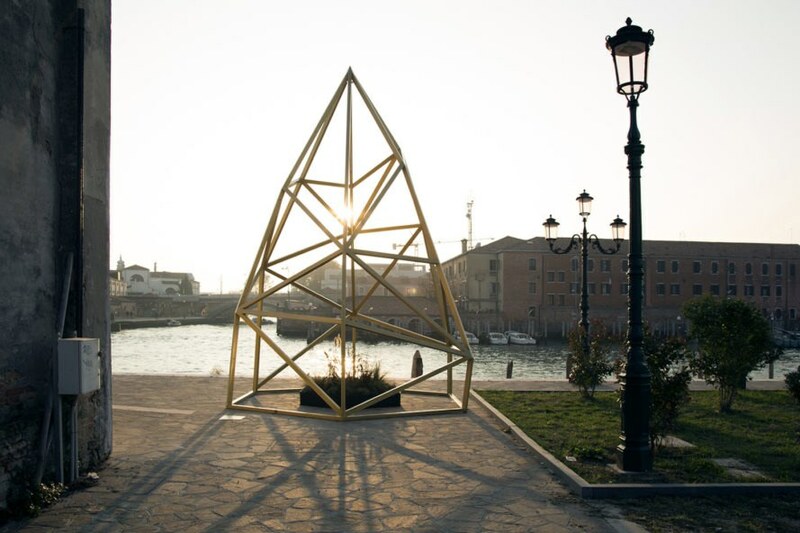 For each conference since, the artist has realized various site-specific installations that take inspiration from recent scientific research and estimates in climate studies. 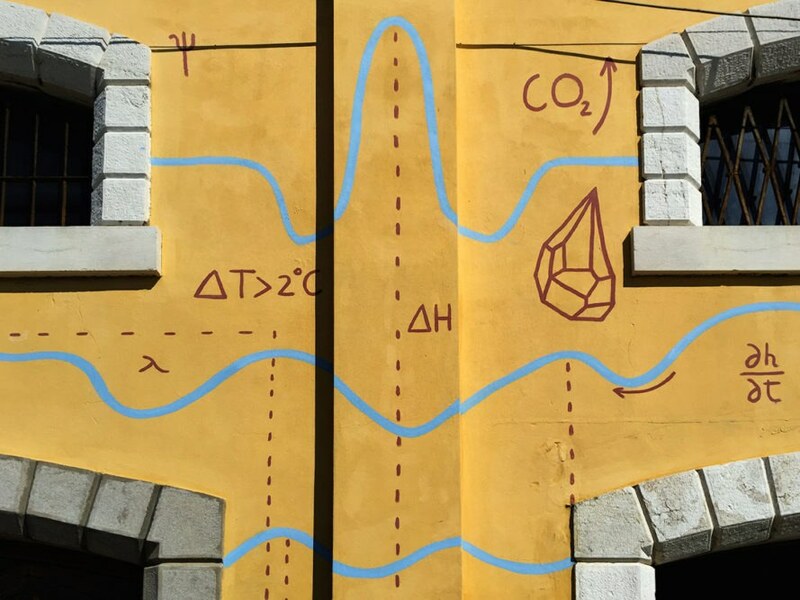 Andreco’s interventions in Venice begins with a giant mural, located next to Canal Grande in Fondamenta Santa Lucia, that represents his artistic interpretation about estimates and data regarding sea level rise in the Italian city. The mural is made of long curvaceous blue lines, punctuated by equations and mathematical symbols, mimicking waves that rise high above a person’s height. A crystalline steel sculpture to the side contains native coastal plants that speak to the importance of the natural landscape in combating storm surges. The last part of the intervention was a series of talks by international researchers held to stimulate public discussion about climate change.